Although they are not the stars of this dish, I wanted to try out another savory recipe to use up the rest of the apples from our adventure to Wisconsin. Roasted apples are super delicious, especially when paired with sweet potatoes (one of my absolute favorites) and topped with a drizzle of olive oil and fresh rosemary sprigs. I also love roasted parsnips (this is basically the only way I care to eat them) because they develop a really great texture in the oven and are also a little sweet. However, feel free to omit them from this recipe if parsnips are not your thing! 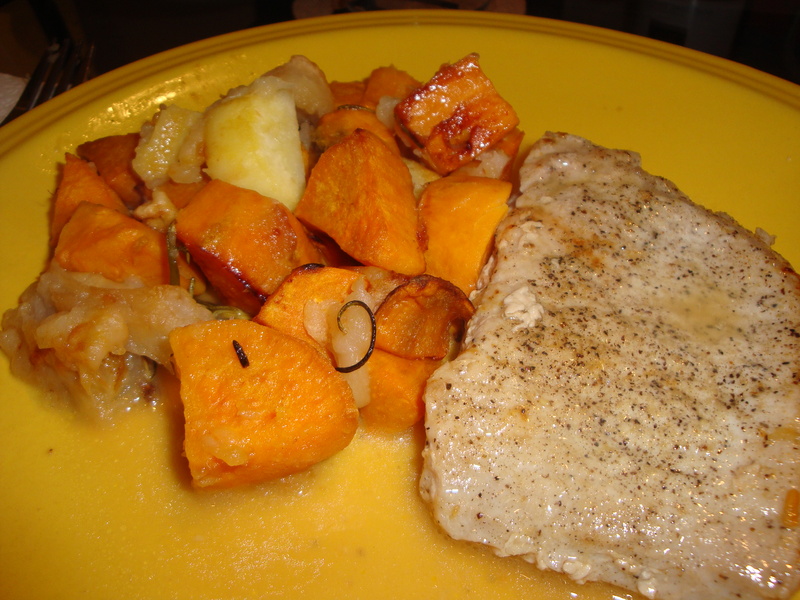 Pork chops go great with tarter fruit sauces, so I also thought they would be a great protein addition to this meal; the apple cider-dijon glaze is like fall in your mouth. When it all came together, this apple-inspired dinner turned out to be a big hit! Remove the pork from the refrigerator and let stand at room temperature while the oven preheats. Preheat the oven to 450°F. Place a large rimmed baking sheet in the oven and heat until very hot. To cook the vegetables and apples: In a large bowl, toss the sweet potatoes, apples, parsnips, and rosemary with the olive oil to coat. Season with salt and pepper. Carefully remove the baking sheet from the oven and spread the vegetables and apples on it. Roast, turning the ingredients over halfway through, for about 15 minutes, or until the potatoes are nicely browned and tender. Pour off all but 1 teaspoon of the oil from the skillet, leaving the brown bits in the pan. Return the pan to medium-low heat, add the apple cider, and bring to a simmer, scraping up the brown bits with a wooden spoon. Whisk in the mustard and simmer for about 2 minutes to reduce the liquid slightly. Remove from the heat and whisk in the butter to lightly thicken the sauce. Season to taste with salt and pepper. Posted on October 30, 2013 by Jilly G	• This entry was posted in Recipes and tagged apple, cider, dijon, fall, pork, sweet potatoes, vegetabl. Bookmark the permalink.